Thanks for the enthusiastic response on a Fabric Swap! In case you read earlier in the day and missed it, I went ahead and created a Fabric Swap group on Google. You can sign up from the below box. It will be moderated for a bit until we (er, me) get the hang of it. And, um, if you would like to help moderate it, feel free to volunteer! Personally, I have some patterns and magazines I can purge and will post them this weekend. There are some ‘guidelines’ to posting on the board. Anyone can read the listings. But, you have to be a member to post. And, for now I’m limiting ‘discussions’ to just posting and swapping. You also need to take pictures of fabric and post in files or on Flickr / Photobucket / blog, etc. And, there’s a template to follow for uniformity. I shamelessly stole all this from my local Freecycle group. As for the sloper… My thoughts were more along the motivation standpoint. You can draft from the MSB or Bunka books if you have or download the Bunka style (all the way at the bottom. I’ll be posting instructions from the magazine and books on drafting. There are two styles of slopers. One with multiple darts and one with a single dart. Or you can use one of the fitting shells from Simplicity, Burda or anyone if you choose. This weekend I’ll come up with a time line and suggested supplies. The end goal (for me at least) will be to have a sloper that fits and do a draft-a-long of a simple design from a Mrs. Stylebook or similar publication. My textbooks define all the symbols and I now understand the basic concept. So, I thought it would be fun to take it on as a group to walk through the process. If you’re not familiar, here’s what a MSB design looks like. Plus, I have two semi-local Japanese associates. One, who blessedly knows how to sew! My next post will likely deal with the suggested supplies from Bunka. I want to stress one more time that I know NOTHING about fit. 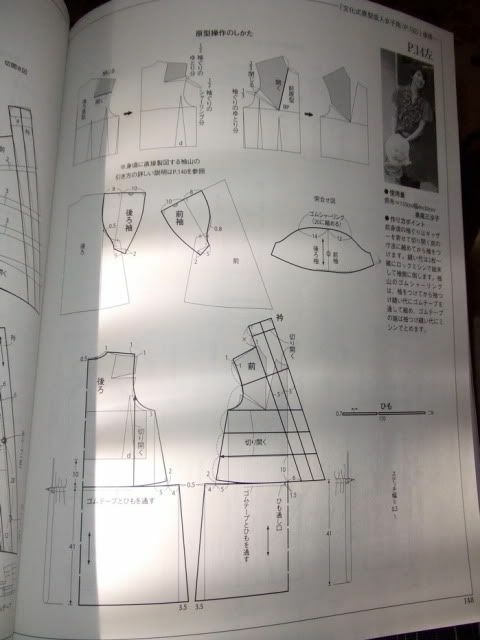 The Bunka book has some basic fitting issues with the sloper. But, I don’t have a thing to offer in that regard. In addition, I won’t be able to tell you how to use a fitting shell / sloper to check fit on patterns. I’m doing this for the purpose of drafting my Japanese magazine collection. Hopefully, when I get the drafting blog set up, we’ll keep it open and those more knowledgeable will volunteer their advice. The official start date will be after PR Weekend in Montreal…. late June / early July. Whew. That’s a lot of information without a single photo! I missed the previous post, but I’m interested in both items you mentioned. I’m coming back to sewing after a hiatus of about 15 years & am busy trying to relearn all the stuff I forgot over the years! I came to your blog via the selfish seamstress’s, BTW & have been a regular reader for the last few weeks. Hi, Cidell. I joined the Fabric Swap group and would like to post a Wanted listing. I can no longer find the guidelines you posted for how to format our posts, etc. Google is giving me some trouble as well, so perhaps it’s there but Google just won’t let me see it. Would you let me know where I can find those posting guidelines?